So I woke up this morning and checked my email. 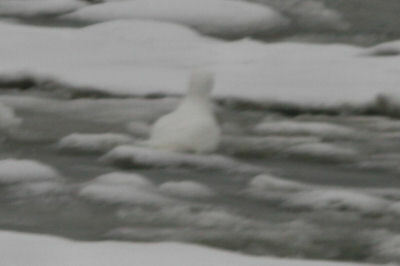 An Ivory Gull in Piermont! What a wonderful opportunity to see this gorgeous species for the first time. Too bad I had to work, and, worse yet, my work would take me to Poughkeepsie, NY, more than halfway to Piermont…so close and yet so far. Somehow the stars must have been aligned correctly though, because I finished up my meetings WAY earlier than I had ever thought possible and I was quickly done for the day. I checked with my office manager to make sure that I was free and clear and got an affirmative. I checked in with a fellow birder to ensure that the bird had been seen today, and got another affirmative from him. I nailed the pedal to the floor of my Buick and got another affirmative in the form of tires squealing. I was off! Now I was on the wrong side of the Hudson River and about 50 miles too far north. The Mid-Hudson Bridge took care of the first problem and then I was heading south on 9W, which I planned to take all the way to Piermont. But the darn road was just not fast enough so in Newburgh I jumped onto I-84 west to the Thruway south and really started moving. You know how in the Star Wars movies when the spaceships jump to lightspeed the stars blur? Yeah, well that was what the other cars on the road looked like. I apologize to the homeowners in Newburgh for shattering their windows with the sonic boom my sudden acceleration caused. My engine screamed in protest at the abuse I caused it by (and you’re not going to believe this) pushing the accelerator through the floor! Let me pause here to explain the hurry. 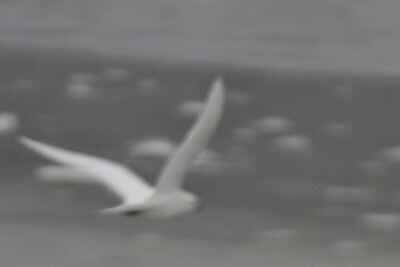 Ivory Gulls are residents of the arctic. They very rarely show up in the lower 48, in fact, the New York State Avian Records Committee list only four accepted records. It is highly unlikely that many are present without being noticed as a bright white gull is hard to miss. And when I say bright white I mean it! The only parts of the bird that aren’t white are its eyes, feet, and beak. This is one gorgeous bird! So I got to Piermont without wrecking somehow (like I said, the stars were aligned correctly) and headed out onto the pier. The Red-winged Blackbirds “Conk-a-ree” -ing were nice to hear after a winter without them but I had eyes for only one bird. Other birders leaving the pier reported that the gull had last been seen at 12:30 flying north, but that it seemed to be regularly coming around to pick at the carcasses left by the Snowy Owl. And were there birders there! I met my despondent fellow blogger Mike who had missed the bird and had to go back to work, and numerous other birders, who informed me that the gull had first been seen on Wednesday the 21st but hadn’t been publicized until yesterday because the ID wasn’t clinched until then. Most folks there had already seen the bird in the morning and enjoyed it so much that they were waiting around for another look! I eventually walked all the way back to the beginning of the pier and then back to the end again, hoping against hope that somehow the dozens of pairs of eyes looking had missed it, but was left without a look. I went and sat on a bench next to a building, blocking my view of the bunches of birders. So I must have missed the first cries of “There it is!” because by the time I realized that the bird was flying past overhead it had already flown past, way past, and was out of sight back towards the beginning of the pier. I got moving down the pier, not running (my camera and binoculars make that tough), but walking fast enough that I quickly got out ahead of the rest of the crowd. I could hear people behind me saying things like “great looks,” and “I could see the yellow at the end of its bill [pictures taken earlier in the day show the tip reddish],” and “that was the most beautiful bird ever.” I’m just glad no small children were in my way! It’s there, in the middle, with its back to the camera. The last I saw it, it was heading towards the Tappan Zee Bridge, but don’t despair, that is the direction it had headed when it first disappeared just after noon. Patrick of The Hawk Owl’s nest has much better shots and a nice write-up here, Ed Coyle, the man who discovered the Smith’s Longspur at Jones Beach, has pics here (and also shots of the Smith’s Longspur and the Snowy Owl), and Lloyd Spitalnik has more shots that are much better than mine here. Oh, and here are the Citybirder’s shots (with public transportation directions). And if you are wondering what the heck the “Patagonia Picnic Table” is all about, the term refers to a picnic table at a rest stop in Patagonia, Arizona. A rare bird was seen there, which caused birders to flock there, who found another rare bird, and so on (Patrick has a link that explains it better). It is now birder shorthand for a rare bird sighting made possible by a previous rare bird sighting. Finally, if you want to go to Piermont, here is a link with directions: Rockland Audubon. And finally, finally, if the nice man who let me look through his scope wants to identify himself, I’d consider naming my first-born after him. Update: There’s been some concern on the state listserve about complaints from Piermont residents about people who ponied up the $10 fee to drive out onto the pier speeding and driving recklessly. For the record, I didn’t speed in the town (those streets are steep and curvy) and did not drive out on the pier. My light-speed driving was reserved for its proper place: the New York State Thruway. And seriously, if you go to see this beautiful bird, be responsible, and, even better, spend a couple bucks at a locally-owned store while you’re there. Send it to the Great Lakes, please !! P. L. E. A. S. E. !!!! 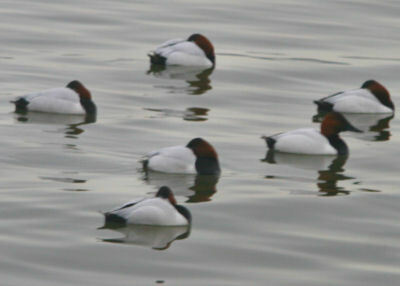 Great Canvasback sighting! 😛 Oh yeah, and that gull is pretty nice too. Now enjoy him while he’s visiting down south but don’t forget to send him home back here for spring. I was so absorbed by the gull and the owl that I forgot to show my kid those Canvasbacks floating just off shore. Here in PA, a flock of Cans like that would have been the high point of a morning. Funny how birds shift in relative merit!